With the release of our new AI Picks feature, Tech Crunch Japan interviewed our founder and CEO Tomochika Kamiya and discussed the new feature and SynchroLife’s vision and future plans! Thank you again Tech Crunch Japan for covering us in this detailed article! The social restaurant review service SynchroLife helps diners find restaurants with an easy to use social media interface in artificial intelligence based recommendations. 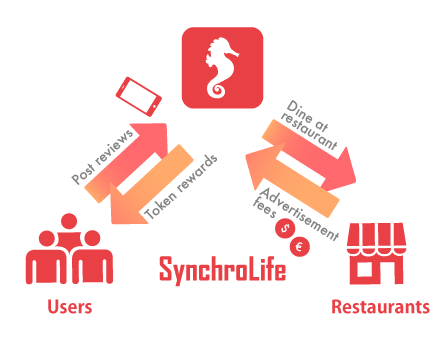 SynchroLife is also unique for including a token economy, rewarding high quality restaurant reviews with tokens (cryptocurrency). Users of the app can also earn cashback token rewards in-app when they dine at participating restaurants. GINKAN Inc (managing company of SynchroLife) released a new “AI Picks” feature for the service at the beginning of April. They deleted the traditional search feature and replaced it with a new “AI Picks” photo-centric interface which allows diners to get artificial intelligence based recommendations based on their current location or other specified locations. SynchroLife also updated its social media timelines, adding a new “For You” timeline filled with personalized content and recommended reviews. It’s true that with traditional restaurant review services it can take quite a bit of time to decide on a restaurant after searching. You have to chose an area and category, then read through reviews and check scores manually to find the perfect place. SynchroLife’s AI Picks feature analyzes which restaurants are attracting the most positive attention on the SynchroLife social media service as well as which restaurants have the most diners that want to go back to the restaurant after visiting once. With this users can quickly find high quality recommendations based on their current location or specified areas and cuisines. The display of users who want to “go back” and repeat their dining experience at a restaurant is new. In the search results you can easily see notes on how many diners want to go back to a restaurant, like “8 out of 10 diners want to visit again!” so it’s easy to tell which restaurants are really worth visiting. SynchroLife is avaliable for both iOS and Android smartphones in over 155 countries and four languages (Japanese, English, Korean, Chinese). SynchroLife already has over 190,000 user posted restaurant reviews. 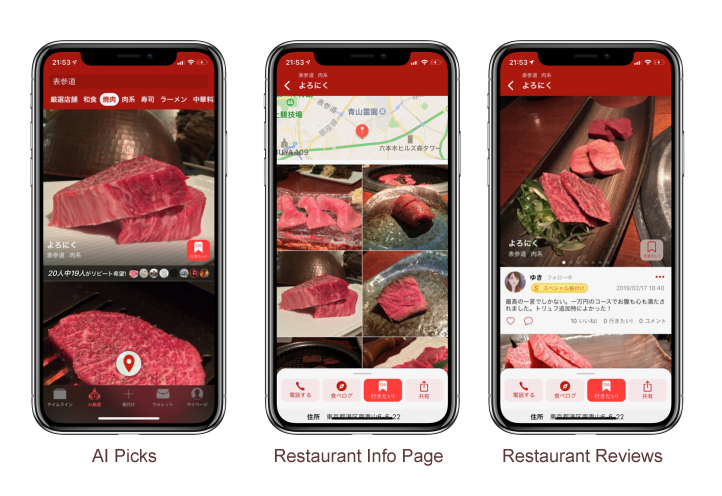 GINKAN plans to continue analyzing user actions and view data, and to further improve the quality of restaurant reviews and recommendations in the platform. In addition to the user side of SynchroLife discussed above, SynchroLife is also a unique product that has implemented a token economy to help solve marketing problems for restaurants. This business model has been well received and GINKAN was chosen to join the competitive MUFG Digital Accelerator’s Batch 4 for spring-summer 2019. 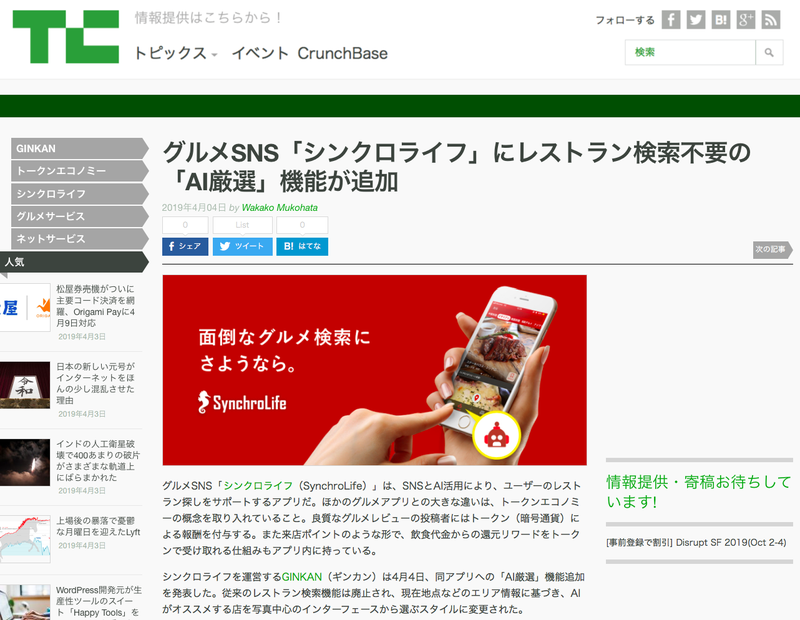 Thank you again Tech Crunch Japan and writer Wakako Mukohata for sharing this article about SynchroLife! We have been covered by Tech Crunch Japan several times, you can read translations of some of their other coverage below.